Ram Vilas Paswan, founder and president of the Lok Janshakti Party, started his political career with Samyutka Socialist Party, and was elected on its ticket to the Bihar State Assembly in 1969. Fighting for the rights of Dalits, Paswan took an active part in the youth movement of 1974 and remained in jail during the entire 15 months when Emergency was clamped on India under the rule of then prime minister Indira Gandhi. After his release in 1977, he joined Janata Party and won the parliamentary elections from Hajipur. Since then, Paswan has never lost an election, except in 1984. However, his journey from Shaharbani village in Khagaria district of caste­ridden Bihar to the post of a Cabinet minister since 1996 has been replete with struggles. one­time foe and Rashtriya Janata Dal chief Lalu Prasad Yadav. The two, along with Samajwadi Party president Mulayam Singh Yadav, have vowed to fight communal forces and may, in fact, dominate the Bihar­Uttar Pradesh belt during the polls. Will this troika help Paswan realise his political aspirations? Ganesha analyses the LJP leader’s stars to predict his fate in the upcoming elections, which he will contest from the Hajipur constituency. Transiting Mangal, Lord of his 11th House of gains, will be in the 10th House of success, under the aspect of natal Mangal. 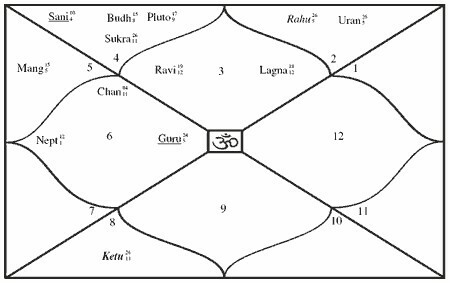 Guru, Lord of the 10th House, will be in the 8th House under the aspect of its own natal position. Saturn, Lord of the 8th House, will be in conjunction with natal Mangal in the 3rd House of courage and efforts, aspecting the 9th House of bhagya and luck. Surya, Lord of the 3rd House, will be exalted trine to its own House in the 11th House of gains. Here too, there is a transiting parivartan, where the 9th, 10th and 11th Houses are involved. Ganesha feels that Paswan will win this Lok Sabha elections with a good number of votes, but not more than what Lalu and his party will be able to clinch. The LJP supremo may also make a dent in Cong (I)’s votebank. Ganesha wishes Ram Vilas Paswan good luck.